Photos and Videos saved in smartphones deleted; Don't worry. Everybody likes to preserve photos and videos for long especially when they are taken through the smartphones and other gadgets. We feel extremely sad when photos taken through the smartphones get deleted by mistake and we can’t get them back despite we try hard to do so. In such cases, we simply ask how to recover deleted photos and files in a mobile phones or other gadgets. Now, guys! As they say “Every cloud has a silver lining.” I tell you how to recover your deleted files from your smart phones. In the blog, I am talking about couple of apps that you can get easily from the play store and these apps fascinate me a lot. Let’s begin from "Dskdigger photo recovery"
You can download it from Google play store and it has got 4.2 rating on Google play store. 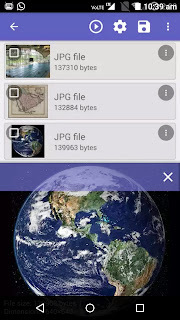 One of the main features of the application is that it can recover data searching cashed and thumbnails from your device that are not rooted however rooted devices can perform better than that of non-rooted ones as it searches all of the memory of the device for any trace of photos and videos. Here are some clues which I understand are enough to make a decision. 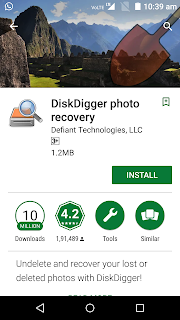 In the free version of Disk Digger recovering videos requires the device should be rooted and only photos and videos can be recovered not any other files while in pro version all sorts of files can be recovered besides photos and videos provided that the device is rooted. 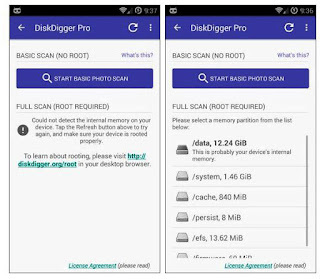 As soon as you start using the Disk Digger in the device it asked whether to scan “full” or “Basic” please note full scan is available only on devices that are rooted and vice versa. 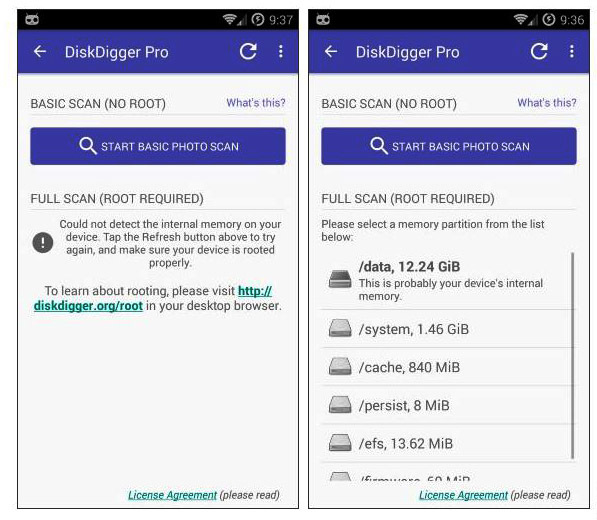 The app allows you to select the memory partition to scan if your device is rooted and internal memory of your device usually appears s “/data”, and the SD card usually appears as “/mnt/sdcard” or something else similar to it. Dumpster provides back up for all deleted photos, videos, documents, and files and it can instantly restore all the data on your device. It provides cloud back up enabling its user to save all the deleted items to the Dumpster cloud. And the app support 14 languages. It works with all android based mobile devices and gadgets. The dumpster can work in both rooted and non-rooted devices smoothly. However, Dumpster performance in regards to memory and battery consumption improves with rooted devices. The apps mentioned above are to my taste and they have got a good rating in google play store as well.